Caravan, Invasion, Exodus © Veronica Montes, Used with permission. 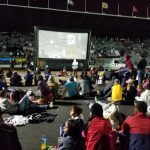 It is near 5pm on Monday, November 5, 2018 when I arrived at the sports stadium Jesus Martinez “Palillo” in Mexico City. 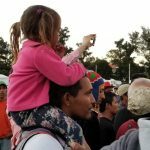 The first Central American Caravan—alternatively called the exodus or Migrant Walking—had arrived two days earlier. Mexico had never seen so many people move, en masse, through its territory, but migratory flow is nothing new. 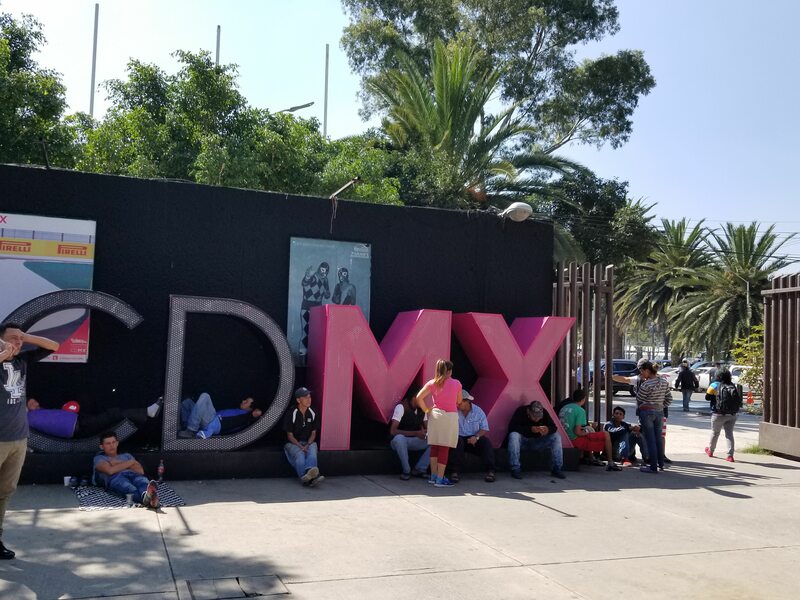 According to Marta Sanchez Soler, coordinator of the Mesoamerican Migrant Movement, around 800 to 1,000 Central American migrants enter Mexico on a daily basis. 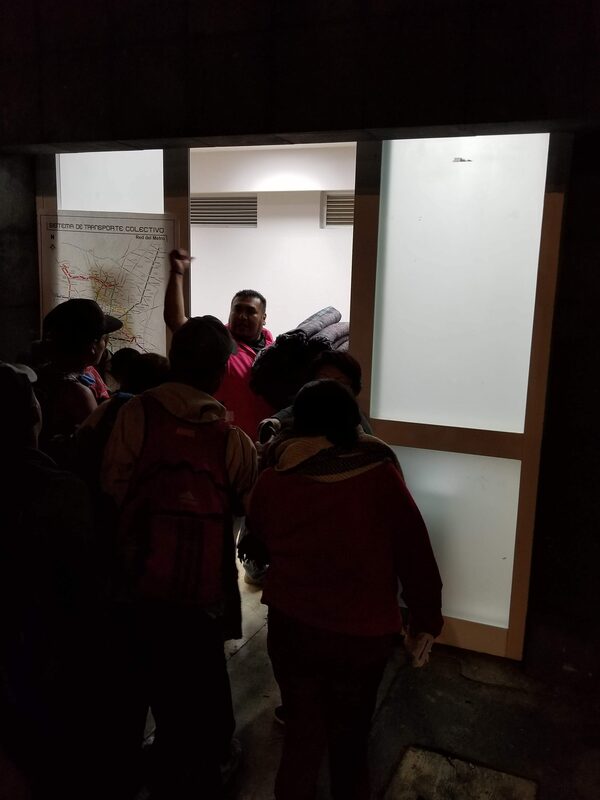 This exodus, started on October 13, is different: the number of people (around 7,000, many families or women traveling with children), the swiftness of their organization, the abandonment of secrecy or invisibility, the determination to travel main roads demanding the right for free and safe transit through Mexican territory. Why are these people leaving their homes, risking their families’ lives, and setting out for the U.S.-Mexico border? The answer is incredibly complex. For decades, the Central American region has endured a destabilized political, economic, and social situation. Among the destabilizing factors, we can point to the failure of the neoliberal economic agenda and the rise of terrestrial cocaine corridors throughout Central America in the early 1990s and the U.S. military interventions and support for undemocratic governments, both of which led to extreme violence in the so-called Northern Triangle (El Salvador, Guatemala, and Honduras). Life has become unbearably dangerous and impoverished for millions of Central Americans.Life has become unbearably dangerous and impoverished for millions of Central Americans. So, as the caravan moved out of San Pedro Sula, an industrial city in northeast Honduras, it grew. Guatemalans, Salvadorans, Nicaraguans, and even Mexicans joined this instrument of survival, this single-minded quest for United States asylum. They are not looking for charity, but for jobs and the chance to live with dignity. They want only basic human rights. Back at the stadium, I am shocked to learn there are no restrictions to entry. Dozens of migrants, mostly young men, spill out onto the sidewalks, sitting to chat or walking to get food. About a dozen police monitor the traffic, giving priority to the Central Americans on foot. By the next day, all that would change: the entrances would be fenced, police presence heightened, and vehicles coming and going with donations. 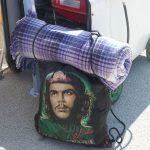 Inside Ciudad Deportiva (Sports City), I follow a river of people past a tent designated “Collection Center,” filled with second-hand clothing, toward a fragile village of handmade tents, cobbled together from plastic, cardboard, wood, or blankets. These are filled with small families, women and children, or gatherings of men. Everywhere, groups of migrants chat together or on their cell phones, resting their feet. I notice their shoddy footwear; sandals are not fit for their journey, yet here they are. 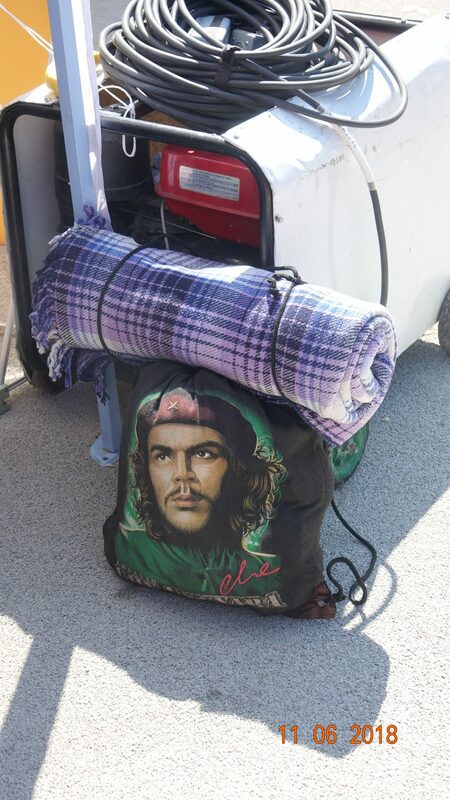 A migrant’s backpack and donated blanket. @ Veronica Montes, used with permission. 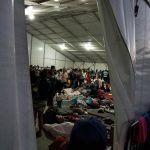 I also encounter dozens of volunteers, journalists, nuns, and staff from national and international organizations verifying the conditions provided for the migrants. The lines to enter and exit the stadium are equally long, guarded by just one police officer. 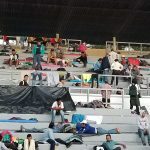 When I finally enter the Stadium, I can see that the upper levels are filled to capacity, and the field has been turned into a refugee camp. The last time anything similar was seen in this country was in South Mexico, when some 50,000 Guatemalans fled genocide in the 1980s. Now, in the middle of CDMX, hundreds huddle in tents. Among the service areas, I find a zone of portable toilets and hand-washing stations. Long lines snake from each, and signs reading “Migrant, remember that the subway is free for you” are taped to the porta-potties. 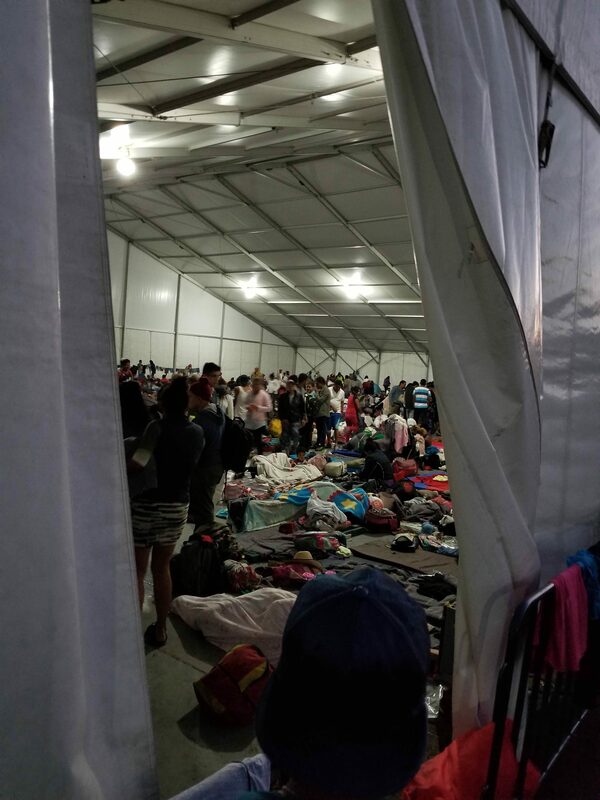 Organizations like UNICEF and OXFAM have set up tents as day care centers for over 300 children; their parents carried them or pushed them in rickety strollers all this way. I explain to the smiling man that I don’t know how to play, and ask how he had come to join this Caravan. “I am from San Pedro Sula,” the man answers simply. With barely contained emotion, I tell him I lived in Honduras years before. His name is Victor, and he walked with the Caravan from the very first day. His wife Lorena is here, too. Victor tells me everything is challenging in his country; if you’re over 35, it’s almost impossible to get a job. He is 49, and impressed that older people in Mexico can make a living with their street stalls. In Honduras, violence is everywhere, and gangs extort pretty much everyone, including the street stall vendors, he says. Indeed, studies show that, from 2009 to 2011, Honduras and El Salvador had the world’s highest rates of homicides. Anthropologist Mo Hume refers to the area’s “violence ritualization,” which saturates everyday life. Victor tells me that every night there are assemblies, but he does not know how long the Caravan will remain in CDMX. He and his wife are traveling without children, but his wife’s niece and three children, one of whom is an eight-month-old infant, are here, too. If things get tough at the U.S. border, Victor and Lorena might just stay in Mexico. He asks me whether life is tough in Mexico. I don’t know how to answer. 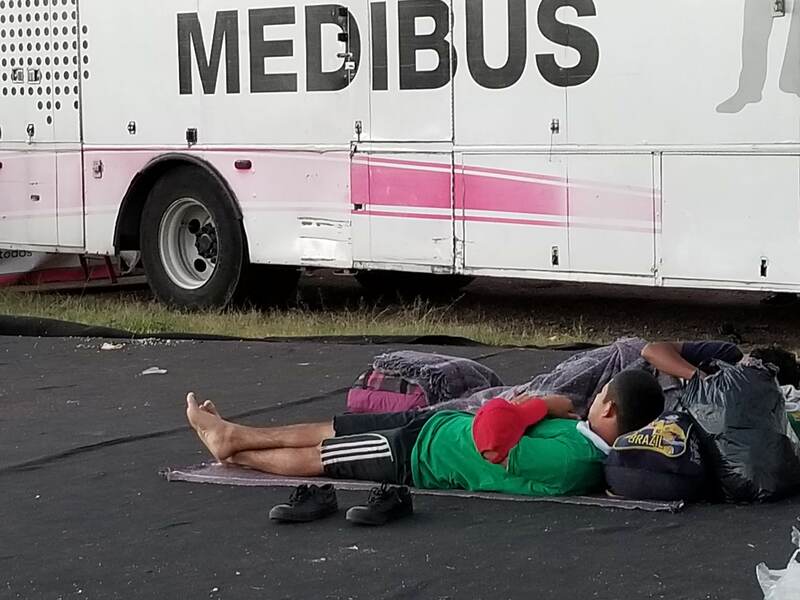 The arrival of the first Caravan in Mexico City allowed all the migrants to regroup after a separation in Veracruz, where the government promised but never delivered buses to transport some to Mexico City. Out of desperation, some migrants continued on foot, and others sought public and private transportation. It also allowed a sort of census of the Caravan: of 4,814 people, 3,088 are adults. There are 184 people with a disability, 87 members of the LGBTQ community, 320 children between 0 to 5 years old, 24 pregnant women, and a number of unaccompanied minors. Of the total, 85% are from Honduras, 8% Guatemala, 5% Nicaragua. and 2% other countries. 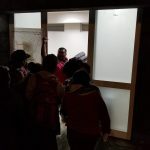 By mid-November, at least three women had given birth in Mexico, and a small group of about 400 (including 87 LGBTQ members) had arrived in the border city of Tijuana. 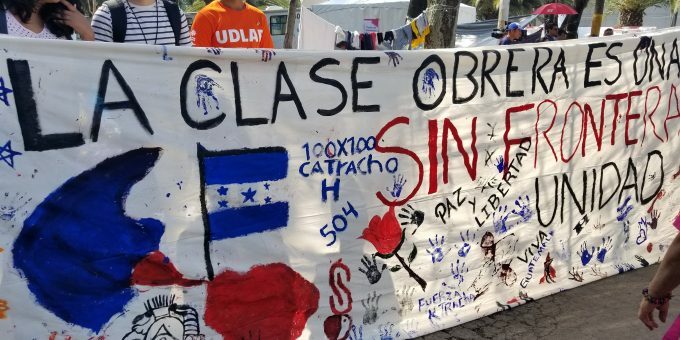 It had been about six weeks since the first Caravan left Honduras and, according to Periodistas de a Pie (Foot Journalists), a media collective that has been with the group since October 13, a total of four Caravans comprising 10,000 migrants were on their way to request asylum in the United States. The reactions to these Central American migrants in Mexican territory has been mixed. Spurred by racist and xenophobic social media posts, small protests have broken out. Some of the same myths deployed against Mexican immigrants living in the United States are being used against the Central American migrants in Mexico: that they will take jobs, that they are criminals, that they want to take advantage of Mexico’s social services, that this is an invasion and an economic burden.Some of the same myths deployed against Mexican immigrants in the U.S. are being used against the Central American migrants in Mexico: that they will take jobs, that they are criminals, that they want to take advantage of Mexico’s social services, that this is an invasion and an economic burden. Of course, because of their social vulnerability, these migrants, like many already in the United States, could only take the most precarious jobs. And even if all 10,000 asylum-seekers remained in Mexico, it would barely change the country’s demographic. Among the world’s lowest immigration receiving countries, Mexico has nearly 120 million residents, and less than 1% is foreign-born. This is no national economic crisis. This is no invasion. This is an exodus. And so, as luck would have it, expressions of solidarity with and empathy toward the Caravan have overwhelmed the xenophobic responses. 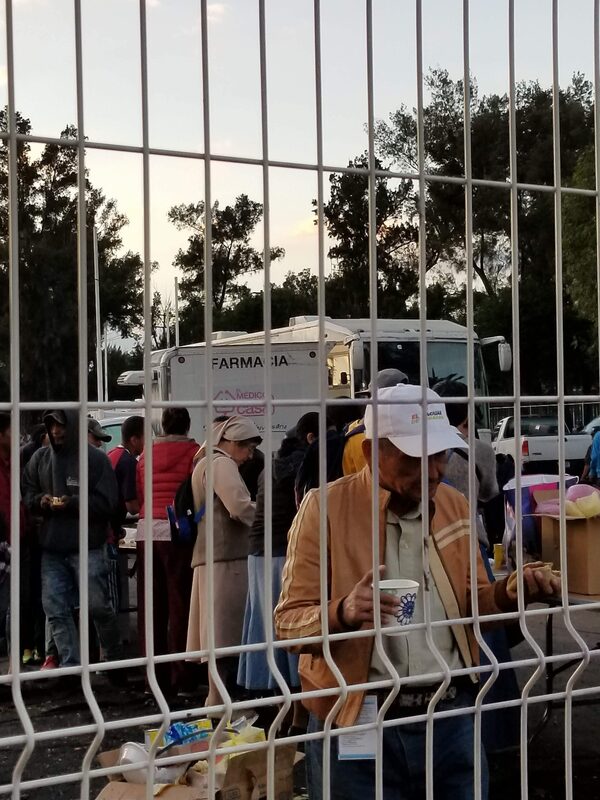 Perhaps because they understand, it has been the most marginalized Mexicans who have dominated this support; in Chiapas, the poorest Mexican state, entire families helped feed the migrants. 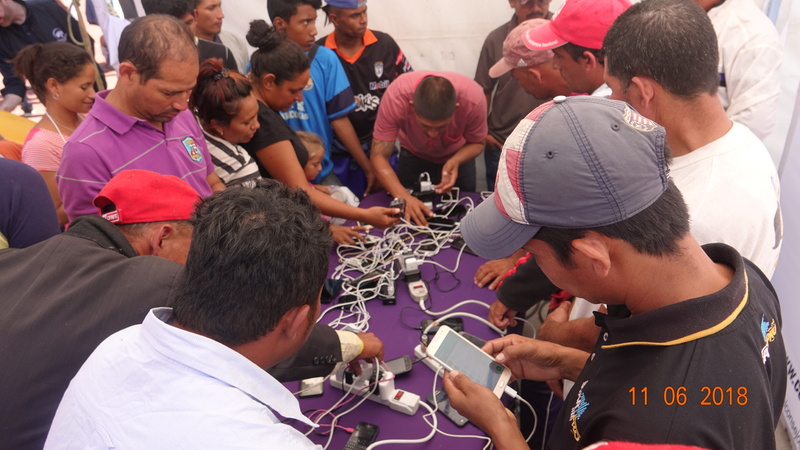 The Mexican federal government has been inefficient, but churches, NGOs, and civil society have responded quickly and efficiently in the face of the Central Americans’ diverse needs. 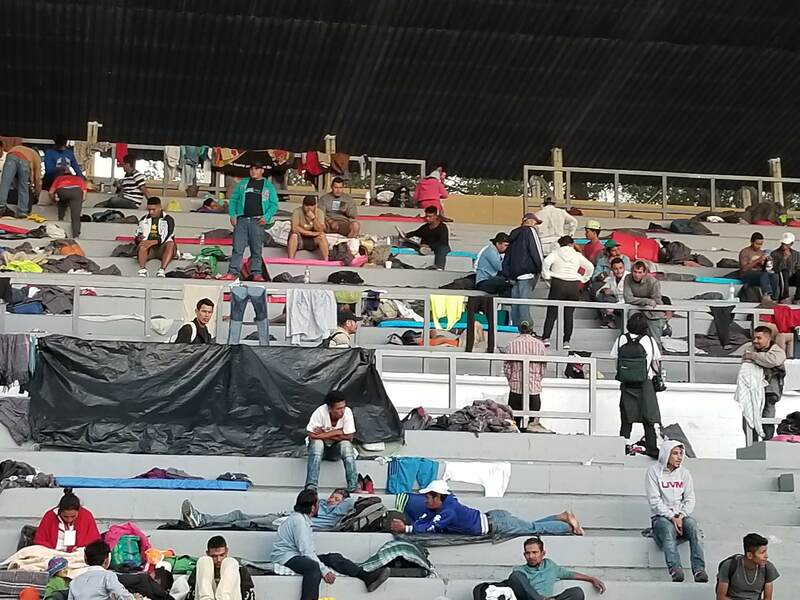 The Caravan’s members had faced rain, heat, cold, hunger, fatigue, illness, dehydration, and childbirth by the time they arrived in Mexico City.As luck would have it, expressions of solidarity with and empathy toward the Caravan have overwhelmed the xenophobic responses in Mexico City. They stayed five days, and I was there for three. I witnessed how families, students, and neighborhood groups visited the migrants with food and clothes, as well as love and support. 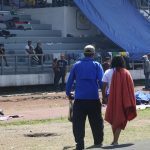 People bypassed the Collection Center and entered the Stadium, because they wanted to personally deliver their donations, share words of support and good wishes with the migrants. For my part, after meeting Victor and Lorena, I launched a Facebook fundraising campaign. My students from Bryn Mawr College (through the Migrant Rights Coalition, a student-led club) helped raise $1,153 dollars in less than a day. With that money, we donated basic hygiene products (toothbrushes, deodorant, toilet paper, etc.) as well as some suitable traveling clothes. 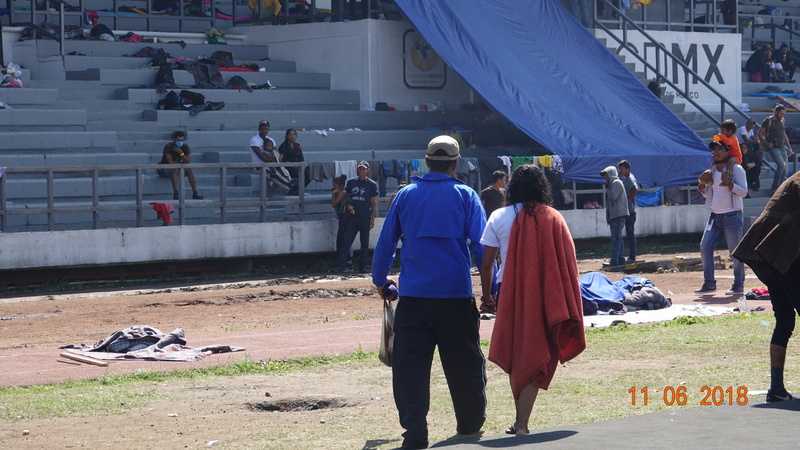 The migrants’ stay in the Stadium was their longest, best-equipped stop on their way to the U.S. border. There, they had the opportunity to undergo medical, dental, and psychological checks. 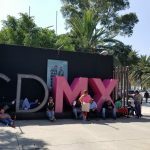 There were “Know Your Rights” workshops about requesting asylum and refuge in the United States, and the Mexican Commission for Refugee Aid (COMAR) detailed how to apply for refuge in Mexico. There were even moments to relax, as local groups hosted movie and game nights, boxing classes, and massage sessions. Delivering the last donations on a Wednesday night, I said goodbye to Victor and Lorena. When I asked Victor when they would start traveling toward the northern border, he said, enthusiastically, “If tomorrow they tell us that we are going, we are ready.” His enthusiasm gives me hope. We embraced and I wished them the best of luck. They still have over 1,500 miles to go before they reach the United States. 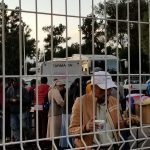 With the help of various organizations, churches, state authorities, and 125 buses, the first contingent of asylum-seekers started arriving at the border on November 13. And with their arrival, a second phase of the exodus begins. On Sunday, November 25, in a desperate attempt, some 500 asylum seekers attempted to cross the U.S.-Mexico border along the San Ysidro-Tijuana crossing point. With tear gas and rubber bullets, the U.S. military and U.S. Border Patrol agents managed to contain the river of people (which included women with young children). 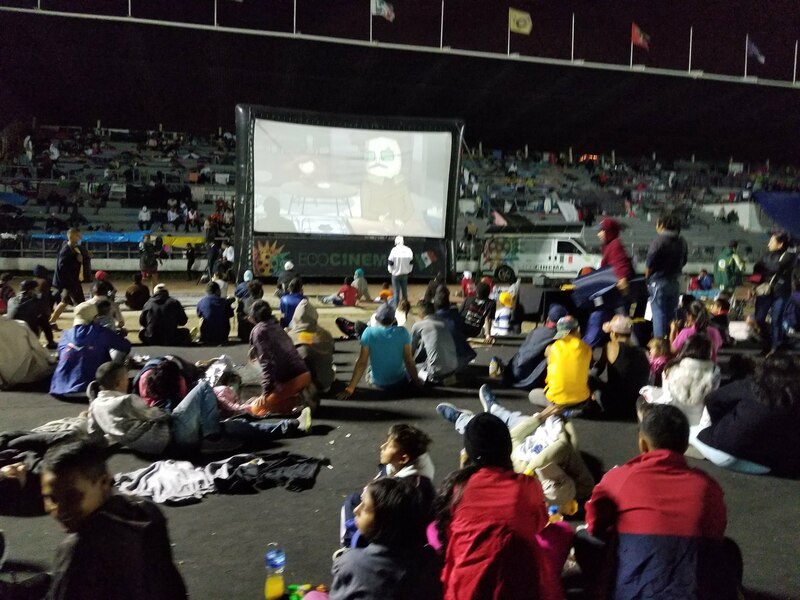 Today, the situation in Tijuana is tense, especially for the 5,221 asylum seekers sheltering in the sports complex, Benito Juárez. 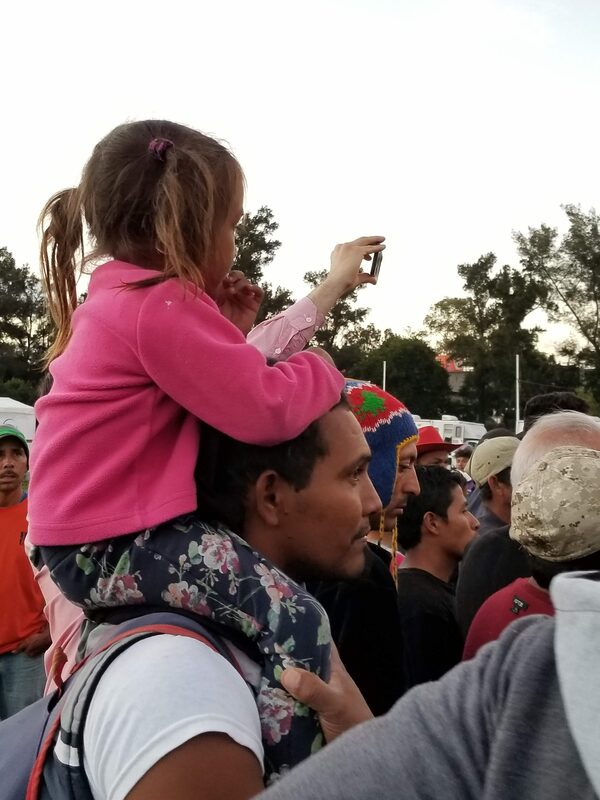 While in Mexico City, civil society and dozens of NGOs generously supported them; here in Tijuana, the migrants are facing heightened xenophobia and racism, as well as refugee-camp level living conditions and an unknown timeline. No one knows whether or when their applications for asylum will be considered. And all this would have been unimaginable only a few years ago. 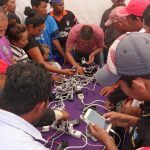 Even so, the mere physical presence of thousands of Central Americans who have traveled almost 2,500 miles to request U.S. help sends a message of fierce determination and peaceful resistance. No wall, no matter how big and thick, can stop this manifestation of humanity. Veronica Montes is in the department of sociology at Bryn Mawr College. She studies immigration from Mexico and Central America to the United States and the intersections between the processes of homemaking, belonging, and migration. Incredibly informative! Thank you so much for your hard work putting these photos and information together! I would love to see a follow-up with data on the percentages of illegal and legal immigrants who find jobs, which sectors they work in and how easy it is for them to make ends meet once they are in the US. Too many conclusions in articles on illegal and legal immigration are based on hearsay and “what we all just know” rather than on hard data. Moreover, distinctions between various categories of documentation (e.g. visa overstays, those awaiting hearings on asylum, those granted asylum, those entering via legal channels) among immigrants are rarely made and I think they should be if we want sound public policy and legislation. Thank you for this informative and empathic report. It is the first time I have heard about the support given to the caravan by the Mexican people. It makes the US behavior at the border even more execrable. I would like your suggestions about how to help, i.e., what organized efforts should I support that are directly helping the people manage their day to day needs? I will in all likelihood association with this! You have also issued me inconceivable grub for the further examinations expertise comptable Guyane.